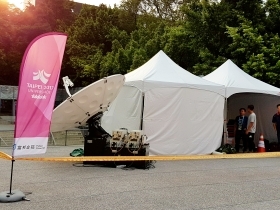 Globecast broadcasts 4K signal of Summer Universiade Taipei. Hong Kong/Paris, August 2017: Globecast, the global solutions provider for media, was chosen to broadcast the Opening and Closing ceremonies of the 29th Summer Universiade Taipei 2017, being held in Taipei, Taiwan. The signals, being broadcast in 4K UHD HEVC format, are available in Asia via AsiaSat 5, Europe via Eutelsat, and North & South America via Intelsat 34. With this transmission, Globecast’s expertise in UHD transmission has been extended to the Asia region with new UHD-capable SNG, a UHD-trained crew and UHD-ready MCR at Singapore. The 29th Summer Universiade, running from the19th to 30th of August, is an international sporting and cultural event staged biennially. The Universiade includes 21 competitive sports as well as one demonstration sport throughout 12 days of competition, attended by talented youth athletes from around the world.